Frank R Billman was born on 4 November 1885 at Lewisville, Monroe, Ohio, USA. He was Grocery Store Owner. He married Ollie B Fisher, daughter of Grant Fisher and Mary Roth, on 29 May 1907 at Monroe, Ohio, USA. Frank R Billman died on 22 November 1953 at age 68. He was buried at Lewisville, Monroe, Ohio, USA. Fred Cabot Billman was born on 30 June 1892 at Lewisville, Monroe, Ohio, USA. He was Storekeeper, Oil Driller. 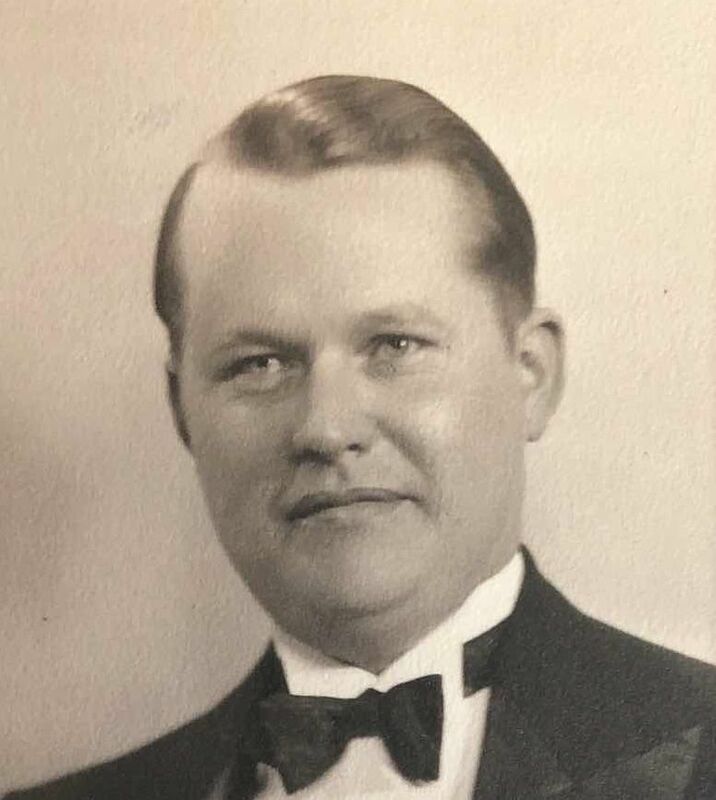 He married Vida Ethel Ogg, daughter of Aaron Wilson Ogg and Magdalene Ellen Draper, on 14 October 1913.1 Fred Cabot Billman was buried in September 1931 at Lewisville, Monroe, Ohio, USA. He died on 10 September 1931 at age 39. [S19] Interview, Frances T. Ogg, c 1996. Gladys M Billman was born on 10 July 1908. She married Alvin H Rudert on 20 May 1933. Her married name was Rudert. Golda Vivian Billman was born on 27 April 1902 at Lewisville, Monroe, Ohio, USA. She was School Teacher. She was also known as Golda Vivian Straight. Infant Billman was born at Lewisville, Monroe, Ohio, USA. She died at Lewisville, Monroe, Ohio, USA. James A Billman was born on 28 October 1872 at Lewisville, Monroe, Ohio, USA. He was Oil Rig Builder. He died on 26 December 1960 at age 88. John Graham Billman Identification from court records at Woodsfield, Monroe County, Ohio.Civil action: Catherine Berger v. John Billman et al. Specificallymentioned are John Billman, Frederick Billman (Charles Frederick) andMary Billman the daughter of John. 11 June 1872. He died at Illinois, USA. 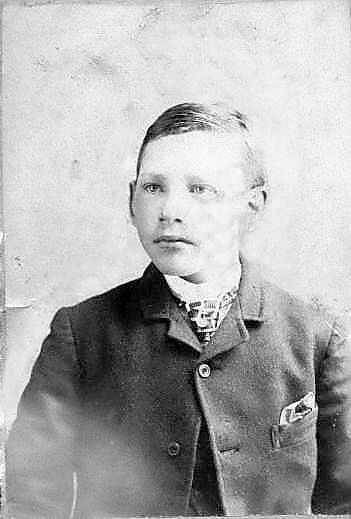 John Hamilton Billman was born on 14 December 1860 at Lewisville, Monroe, Ohio, USA. He was Oil Rig Builder. He married Sarah Elizabeth Kelley, daughter of Sebastian Cabot Kelley and Susan Denbow, on 31 December 1884 at Monroe, Ohio, USA. John Hamilton Billman Carl Denbow has marriage date to Sarah Kelly as 1882. He died on 30 December 1943 at age 83. 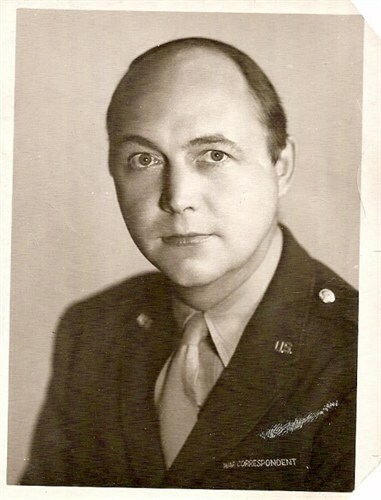 He was buried on 2 January 1944 at Lewisville, Monroe, Ohio, USA. John V Billman was born on 23 June 1904. Marjorie Dorothy Billman was born on 23 July 1899 at Lewisville, Monroe, Ohio, USA. She was School Teacher. She was also known as Marjorie Dorothy Busch. She died on 10 December 1969 at age 70. She was buried at Van Wert, Ohio, USA. Mary E Billman was born on 11 July 1867 at Lewisville, Monroe, Ohio, USA. She married Joseph Oliver Devoe on 15 January 1885. Her married name was Devoe. Mary E Billman died on 14 January 1913 at age 45. Myrtie Blanche Billman was born on 5 July 1890 at Lewisville, Monroe, Ohio, USA. She was Housewife. She married Walter Draper, son of Ludwell P Draper and Mary Belle Wise, on 24 December 1908 at Monroe, Ohio, USA. Her married name was Draper. Myrtie Blanche Billman was buried at Lewisville, Monroe, Ohio, USA. Susie Jane Billman was born on 15 August 1894 at Lewisville, Monroe, Ohio, USA. She was School Teacher. She married James Urban Mallett, son of (?) Mallett and Kate Mallett, on 29 May 1915. Her married name was Mallett. Susie Jane Billman died on 8 July 1978 at age 83. She was buried at Lewisville, Monroe, Ohio, USA. Charles Frederick Billmann was born on 25 January 1829 at Worb Dorf, Republic of Bern. He was Shoe Store Owner. He was present at Charles Frederick Billmann's christening on 6 February 1829 at Worb Dorf, Republic of Bern. He married Hannah Jane Hamilton, daughter of John Hamilton and Margaret Wise, on 8 March 1860 at Monroe, Ohio, USA. Charles Frederick Billmann Christened Earl Carl Friedrich Buelmann, 6 Feb 1829, Worb Dorf,Bern,SZ Sgt, K Company, 78th Ohio Volunteer Infantry - from grave marker. [S20] Catharine Foreaker Fedorchak, Fedorchak History. [S115] Gunnar B. Björnson, Afi's Saga, pp. 1-2. 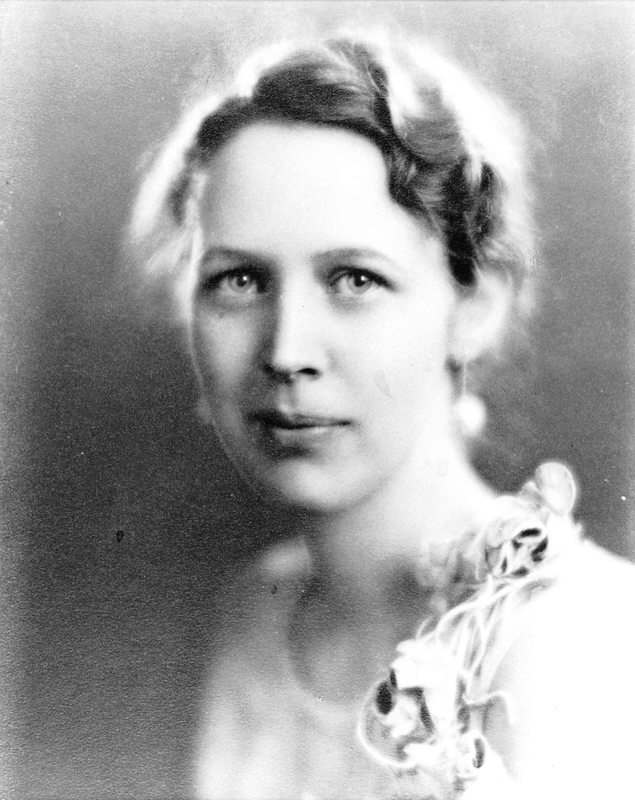 Helga Sigríður Björnson was born on 6 January 1912 at Minneota, Lyon, Minnesota, USA.1 She married Arne Brøgger in 1935. Her married name was Brøgger. 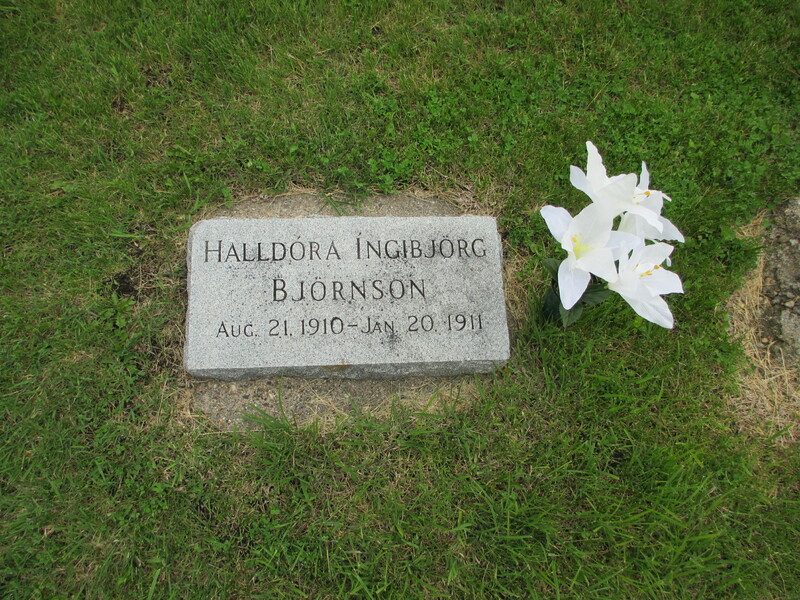 Helga Sigríður Björnson died on 28 June 1996 at Minneapolis, Hennepin, Minnesota, USA, at age 84.1 She is buried at Ft. Snelling National Cemetery, Plot N, 0, 660 at Ft. Snelling National Cemetery, Minneapolis, Hennepin, Minnesota, USA. 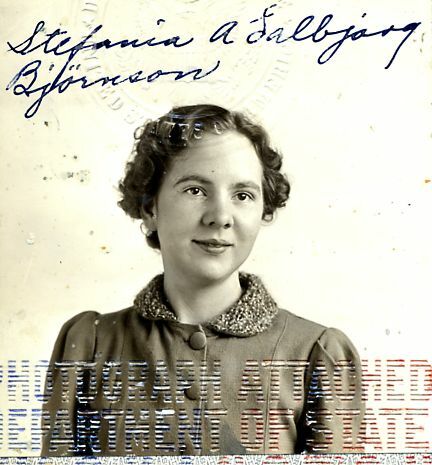 Stefanai Denbow's 1938 passport photo. Sylvia Björnson was born in 1948. She died in 1960 at Minneapolis, Hennepin, Minnesota, USA; Died of leukemia. [S23] Unknown name of person, unknown record type, Ancestry.com. Minnesota, Death Index, 1908-2002 [database on-line]. Provo, UT, USA: Ancestry.com Operations Inc, 2001. Elizabeth Lasley Black was born on 18 September 1780 at Ohio, USA. She married James Graham, son of James Graham and Martha Hutchinson, on 12 October 1782 at Pennsylvania, USA. Her married name was Graham. James M. Black PLace of Residence: Ramseytown, Jefferson County, Pa. in 1926 movedto Rossiter. Mary Black was born in 1811 at Virginia, USA. She also went by the name of Polly.1 She married Joshua C. Bobo, son of Jared Bobo and Lucretia Burton, on 22 March 1832 at Athens, Athens, Ohio, USA.1 Her married name was Bobo. Mary Black died on 2 February 1880 at Vinton Station, Vinton, Ohio, USA. Ronald Reid Black was born on 21 March 1931 at Pennsylvania, USA. He Occupation: Salesman Places of Residence: Towanda, Pa; Pinole,California; Michigan; and Memphis, Tennessee. Religious Affiliation:Presbyterian Military Service: U.S. Navy. He died on 9 June 1964 at Pinole, Contra Costa, California, USA, at age 33. He was buried at Tennessee, USA. Samuel Boucher Black was born in 1904. He married Mary Christeena Reid, daughter of David Reid and Cora Mulhollen, on 10 June 1930 at Pennsylvania, USA. Samuel Boucher Black Occupation: Dentist Places of Residence: Beaverdale, Towanda,andIndiana, Pa. Boynton Beach, Florida. Notes of Jean Reid Edwards:Samuel Black's mother was a Boucher. Notes of Jean Reid Edwards: Samwent to Penn State at the age of 16. He spent 4 years at theUniversity of Pennsylvania in Philadelphia. He opened a practice inBeaverdale, Pa. and left in 1978 when the miners went on strike. Hethen opened a practice in Towanda, Pa. Jean states that Wilbur Black'got the opening in Indiana, Pa.' because he and his wife either had achild or were expecting one and their father felt that the practice inIndiana was the better one? She also notes that the Blacks bought inBoynton Beach when the roads were still dirt roads and it was justorchards. She says they ran some orchards for years. He died on 14 November 1976 at Boynton Beach, Palm Beach, Florida, USA.